Join director Scott Davis and I at the LGBT Center in Chelsea, New York, as we discuss the play adaptation of my memoir, The Inheritance of Shame. More information at The Center website. 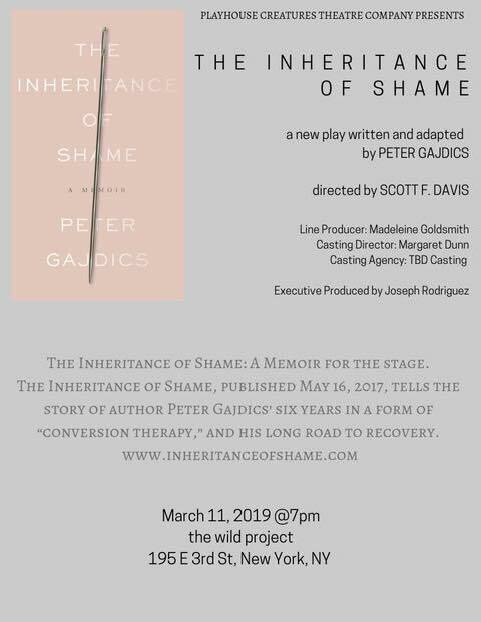 Join me for a one-night only staged public reading of the play adaptation of my memoir, Inheritance of Shame, on Monday, March 11, 7 p.m., at The Wild Project in New York. Directed by Scott Davis, produced by Playhouse Creatures Theatre Project Company. See the below poster for more information; or here. Join me at the International Forum for Psychoanalytic Education’s 29th Annual Interdisciplinary Conference, where I will talk about “unsilencing” my past in conversion therapy, and some of the “lessons learned” on my road to recovery. Celebrate Vancouver's Pride Week and join me at Little Sister's Book & Art Emporium as I read from my memoir, and then discuss prevailing themes such as oppression, self-acceptance, and resilience. Celebrate Pride week in Victoria, British Columbia, and join me at the Victoria Public Library (main downtown branch) for a reading from my book, The Inheritance of Shame: A Memoir, and a talk about my experiences undergoing a form of conversion therapy in Victoria. In honour of the International Day Against Homophobia, Transphobia and Biphobia, please join us on May 17 for an "In Conversation" between Peter Gajdics, author of The Inheritance of Shame, and Morgane Oger, trans politician and activist. Presented by The Vancouver Public Library, in partnership with the Morgane Oger Foundation. I am delighted to be nominated for The Publishing Triangle Randy Shilts Award for Gay Nonfiction. Join me and all the authors as we read from our nominated books at the Bureau on April 25. The Writer's Block talks to writers of all ilks and gets their thoughts, ideas, how they come up with their stories, lyrics, poems, etc. To listen to the program, tune into Channel 2 on the site, http://latalkradio.com/content/writers-block. To call in: 1-818-602-4929. Join Lucy Jane Bledsoe, Julia Serano and me for readings from our latest books and audience Q&As at Dog Eared Books (Castro), San Francisco, on Monday, November 13, 7 p.m. I will be signing copies of my book, The Inheritance of Shame: A Memoir, at the Indigo bookstore in downtown Vancouver on Saturday, October 14, from 2 - 4 pm. Reading and in-conversion with author Lucy Jane Bledsoe, who will also read from her own book, A Thin Bright Line. In-conversation with Anne Raeff, author of The Jungle Around Us. Screening of documentary "Call Me Kuchu" at The Art Theatre, followed by panel discussion about conversion therapy with Ellen Hartwick, Clinical Director from The LGBTQ Center Long Beach. Book Launch for "The Inheritance of Shame: A Memoir"